Beautiful skin is easily achieved through the use of modern hypnotherapeutic techniques by combining the suggestions for the proper skin care regimen with the suggestion for your body's natural processes. To cooperate with your new decision to have beautiful skin, you will easily be able to achieve to look you desire. On the recording for beautiful skin, you will be given suggestions to properly hydrate your body, to properly wash you skin, to properly care for your skin, to avoid excessive ultra violet (UV) rays, and to eat an appropriate diet all with the goal in mind of having skin which is radiant, young looking, and healthy. Excess oil and any possible acne or acne related scars or scars in general are also controlled with the use of this hypnotherapy recording. Every angle has been addressed in this recording so that no matter what your particular situation is with your skin, you will find success with this particular hypnosis recording. The Beautiful Skin Hypnosis CD or MP3 is designed with the knowledge that the skin is the body's largest organ. It is both an organ of absorption and elimination. You probably are aware of the fact that hypnosis can help you overcome bad habits and fears, but you may not realize that hypnosis has the power to make physical changes in the body, including improving skin. Bad skin - either too dry or oily is often the result of hormonal changes that cause either an excessive amount of oil to be produced or not enough. In either case, skin is left unbalance which ultimately results in blemishes and major break outs. One of the biggest controllable causes of hormonal imbalances is stress. Hypnosis works on stress, so that stress doesn't manifest itself on your face. Hypnosis has the ability to completely relax individuals and to put the body in a state where stress signals are quieted. Everyone experiences stress, so it is unrealistic to avoid it. What needs to be learned and is accomplished through hypnosis is the management of stress. When stress is reduced, the immune system is stronger against external factors and signals that release excessive hormones are quieted internally. Dr. Steve G. Jones M.Ed. 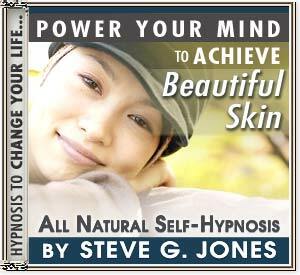 has created a self hypnosis program called "Beautiful Skin." In it, he uses his skills as a clinical hypnotherapist to completely relax the mind and body. You will be led in your thought processes through hypnosis to relax, eat right and take care of your skin in a way that will leave it glowing and beautiful. Situations such as acne can often be corrected by instructing the client, while in hypnosis, to begin to properly care for the skin organ. For example: taking in more water, eating appropriate food, getting proper rest, etc. It has been found that these actions also reduce and prevent wrinkles.